GALION — The City of Galion, in partnership with the Galion Ministerial Association, will have a Community Clean Up Day on Saturday, June 17. Area sponsor for this cleanup event include Avita Health System, Galion Building and Loan and Grace Point. Galion residents have an opportunity to get their yards spruced up and looking great. Volunteers will be available to assist those who request help. There will be a drop-off site for trash. It will be behind the Gal ion City Building, 301 Harding Way East, from 9 a.m. – 2:30 p.m. on June 17. Last year’s cleanup campaign, held in May, was a great success. About 130 volunteers joined the effort. They helped with drop-offs at dumpsters, and more ore than eight huge containers of refuse were collected and disposed of. That total doesn’t include items picked up by the city. Volunteers also went to homes that requested assistance with yard work or hauling junk items. Other groups planted flowers at the square in Historic Uptowne Galion and performed improvement projects at Heise Park. This year’s drop-off is available only to City of Galion residents. Drivers licenses will be checked. Trash can be taken to dumpsters at city building. Medication can be taken to permanent drop box at the Police Department any time. Curbside pickup of trash and yard waste will be on Monday, June 19. Streets will only be cleared of trash and yard waste only once, so be sure to have items placed on the curb early. Tires. Tires will not be collected at all during this cleanup action. To request volunteer assistance or to become a volunteer, call 419-468-1857 or register on the city website. File photo | Galion Inquirer City of workers spent several days picking up refuse after last year’s community cleanup effort. 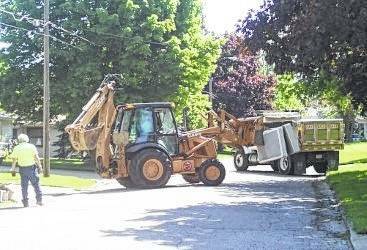 http://aimmedianetwork.com/wp-content/uploads/sites/38/2017/06/web1_cleanupday2.jpgFile photo | Galion Inquirer City of workers spent several days picking up refuse after last year’s community cleanup effort.